First United Church in Owen Sound has had a successful drive over the 2008 Christmas Season for Sleeping Children Around the World. In October of 2007 we did a presentation during a Sunday service about our SCAW distribution in Calcutta, January 2006. This year the Christian Action Committee at First United displayed the bedkit from Calcutta during the Advent Season. When the donations were all counted this year this Church group had raised money for 101 bedkits. Congratulations First United Church, Owen Sound. In December, 2008 Bayview Elementary School in Owen Sound raised money for 42 bed kits. The Project was led by Mrs. Linda Breen and her Grade five class. At an assembly for the 336 students at Bayview, we showed our photos of the SCAW delivery in Togo, Africa, May 2008. 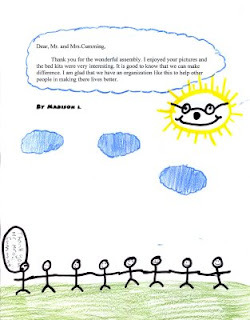 The grade five class prepared thank you notes and some samples are attached. Congratulations to this school and their teachers for making such a substantial contribution to Sleeping Children Around the World! Ken and his SCAW team are welcomed to the Philippines. A woven sleeping mat, a child's pillow and orange pillow case, a soft blanket and mosquito net, three sets of brightly coloured T-shirts and shorts, a pair of sandals, socks, a handkerchief, school supplies, a backpack, a raincoat, a towel and washcloth and a package of toothbrushes. Last week, Hillsburgh resident and travelling volunteer Ken Graham pulled these items one by one from a large plastic bag printed with a heart and the words "gift of love," and laid them on the carpet in my living room. As he told me about the rationale for each item's inclusion in the package, my youngest daughter, who is nearly two, bounced happily about the room, collecting the shorts and T-shirts and sorting them into piles while trying to hold the sandals on her tiny feet. "Our priority order is something comfortable to sleep on, then clothing, then school," Graham said. As I watched my daughter, I wondered if a child a world away might react in much the same way. For his part, Graham need not wonder. In April, this grandfather of 10 will board a plane for the Philippines. It will be his seventeenth trip overseas for Sleeping Children Around the World, a unique charitable organization he has worked with since 1991. During his two-week stay in the Philippines, Graham and five fellow Canadians will distribute 6,000 bed kits similar to the one he showed me to children in need. $35. That is the cost of one kit and Sleeping Children ensures that 100 per cent of every bed kit donation goes directly into that heart-printed plastic bag. "It's what drew us in the first place," Graham said. "Every cent goes to the children." Travelling volunteers like Graham pay their own way, covering the expenses of their own airline tickets, accommodations, and ground transportation to distribution sites. Operating costs, including the salary of the Sleeping Children's one employee, are paid by a trust established by the charity's founder, Murray Dryden of Toronto. And the organization does not advertise. Instead it relies entirely on word of mouth communication about its work. It never solicits donations. "You give from love," Graham said. "Not guilt." This year, Sleeping Children will distribute its one millionth bed kit in one of the 33 countries it serves; countries in which the average household income amounts to a dollar or two a day. "You and I can't imagine that," he said. "If a child can get a good night's sleep, he'll be able to have a good day at school the next day. And it's not just the child who benefits; it's the entire family." And how does Graham feel about contributing his financial resources, in addition to his time and skills, to give a child a good night's sleep? "If you had any idea how much I get out of it," he said, trailing off and taking a deep breath. "I don't begrudge one cent." Christie Zimmer lives and writes in Guelph. Email her at christiezimmer@rogers.com. Somewhere amidst all the doom and gloom there has to be a silver lining. There was last time - even if Murray Dryden didn't see it right away. But the math is simple enough: no Great Depression, no epiphany, no coming trip to India for the heirs of Murray Dryden. Two weeks from tomorrow, the Dryden clan - Murray's son and daughter, a daughter-in-law, a granddaughter, grandson-in-law, four great-grandchildren and a stepson, stepdaughter and step-grandson from a much later second marriage - will set out for Pune, India. "We want to complete the circle," says Dave Dryden, Murray's older son. His younger son, Ken - the Hall of Fame goaltender who now blocks shots on Parliament Hill - would be there, too, if he weren't recovering from hip-replacement surgery. The Dryden "team" is headed for an orphanage where, 39 years ago, Murray Dryden handed the first child a small kit that contained just enough material - ground sheet, blanket, pyjamas, a few incidentals - to allow that child a fair night's sleep in a world that can be stunningly unfair to children. Murray, one of the great dreamers, set a goal for himself that before he was done he would make sure that a million poverty-stricken children had a "bed kit" of his or her own. He didn't quite make it, passing away three years ago at 92, but he came close enough that it will happen this year. Dave Dryden, himself a brilliant goaltender in the old days of the World Hockey Association, knows when and where but prefers not to say. Instead, he likes to think, "Every child we give a bed kit to in 2009 is the millionth." Sleeping Children Around the World is a unique charity. One hundred cents of every dollar raised ends up in a bed kit. Volunteers put the kits together and volunteers, entirely at their own expense, travel to the most destitute parts of the world to live up to Murray Dryden's belief that a safe and good night's sleep is a basic right of childhood. Murray was the eldest of eight children raised on a farm near Domain, Man. He fared poorly at school, dropped out and tried to make his way as a salesman just as the Depression hit. He sold anything he could - silk stockings, can openers - and he kept a small diary that hints at how truly hard life can be in hard times. "June 23-28: Put in terrible week. Made less than $10. Slept on the office floor the last couple of nights and ate only when in dire need ... but there is always a better day coming." But there wasn't, not for the two years he wandered. He barely ate. He hopped freight trains. He once walked from Regina to Moose Jaw. He nearly froze to death. He slept, when he could, in parks and empty office buildings. But every once in a while a phrase would sparkle in his diary: "Outlook brighter." A car stopped. He made it to a farmhouse and hoped for a haystack to sleep on, only to be invited in for food, tea and a real bed. He never forgot what that meant. Murray Dryden survived the Depression and emerged a superb salesman: a big, hearty man people instinctively trusted. He found success in construction and Christmas trees. He married kindergarten teacher Margaret, and they moved to 28 Pinehurst Cres., Islington, where the two boys and Judy were raised and where their eccentric father had the backyard paved so the kids could play hockey all year round. Standing at Judy's bedroom door one evening watching the child sleep led to this crazy idea that you give small comfort to children who have none. Sleeping Children, to this day, is still run out of the home with the paved backyard. He put millions of his own money into the charity - even donating his Christmas tree farms - but something about its simplicity attracted an endless line of volunteers. Ten years after Margaret died in 1985, he married Theda Burton, a woman he had once dated in his youth and whose name he came across in a contribution. After Theda's death, her children joined the Dryden children in carrying on the legacy. They will go to India and pause in remembrance of a big, laughing man who sneezed too loudly, once tried out an ill-advised toupee and wore suits that Don Cherry would applaud. "He was the 1970s before the seventies ever happened," Ken said in the eulogy he delivered at his father's funeral, "and his clothes never left the seventies." But they will also remember a man who also never left the Dirty Thirties, who came out of a long Depression determined to make the world a better place. "If we want to know more about our father," says Dave Dryden, who now regularly travels for Sleeping Children, "we need to do this. "It was such a big part of his life, but we didn't really know it. "We knew he was doing it, of course - but until you go yourself, you can't really know what it means."